You'd think something named “sweetpotato” would be a bit more attractive, but the tuber's lack of visual appeal can be forgiven once it hits the palate. Sweetpotatoes are an excellent source of beta-carotene, vitamin A, antioxidants and anti-inflammatory nutrients. But let's be honest—the sweetpotato's real charm is its versatility in providing a vessel for melted butter, cinnamon, curry, raisins, and a host of other sweet and savory flavors. So we are most fortunate that this old-world vegetable has become one of the newer specialty crops in the National Clean Plant Network. As one of 7 crops in the network, sweetpotatoes benefit from the attention of scientists and growers who are committed to protecting the species from harmful viruses. Such a team of sweetpotato saviors staff a clean plant center at Louisiana State University. 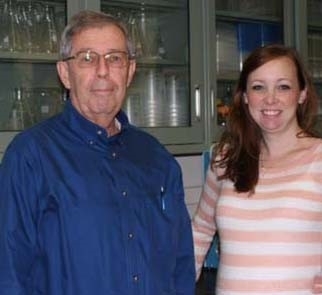 Dr. Chris Clark and Emily RIngeman are part of the expert team that manages the Sweetpotato Clean Plant Center at Louisiana State University AgCenter. Over 60 years of collective experience are represented by the team members who collaborate across two locations: the Sweetpotato Research Station in Chase, and the Plant Pathology & Crop Physiology program in Baton Rouge. Virus therapy, tissue culture propagation, and virus testing are conducted on the LSU campus in Baton Rouge by Emily Ringelman and Chris Clark. Emily came to the LSU AgCenter with a B.S. in biology from the University of Minnesota and experience managing conservation and population genetics projects at UC Davis and in as a BioProcess associate in the Affymetrix Reagent Operations Group. Away from the lab, Emily is an accomplished hand knitting pattern designer, with several published designs. Chris earned a PhD in plant pathology at Cornell and has been teaching and conducting research on sweetpotato diseases for 39 years. Once they leave the lab, virus-tested tissue cultures are transferred to greenhouses at the LSU AgCenter Sweet Potato Research Station in Chase, LA. The team members there include Tara Smith, station coordinator, Arthur Villordon, Professor and lead scientist, research associates - Theresa Arnold, Cole Gregorie, and Bill McLemore, farm manager - Jimmy Ronsonet and numerous support staff. The team works collectively to manage the greenhouse and field operations, propagating the plants through several stages to eventually produce foundation ‘seed' storage roots as well as greenhouse-grown vine cuttings that are marketed to commercial operations throughout Louisiana, the U.S. and internationally. Arthur earned his PhD from LSU with a concentration in sweetpotato breeding and genetics and has been conducting research on sweetpotato growth and development for over 25 years, most recently establishing procedures for producing sweetpotato plants in an aeroponics system which has greatly enhanced propagation potential and efficiencies in our foundation seed program. Tara works extensively with the sweetpotato industry throughout Louisiana, the United States and abroad. Educational efforts regarding clean seed and virus infection, directed at our clientele coupled with the advisory process are helping to direct research efforts on station and contributing to the sustainability of the Louisiana industry. Our research support team working at the station has over 60 years of combined technical experience which has contributed to improved efficiencies and operations related to all aspects of the sweetpotato foundation seed program and efforts to produce clean planting material for our industry. The sweetpotato teams' collective technical expertise is complimentary to the end goal, which is producing high quality plant material to service the sweetpotato industry.